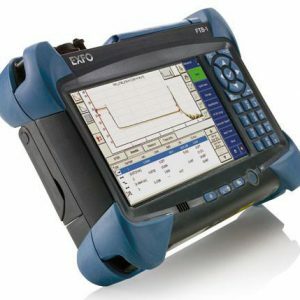 The Noyes M710 from AFL Telecommunications is a compact, full featured, single-mode OTDR that includes an integrated Visual Fault Locator (VFL), an Optical Power Meter (OPM) displaying up to three wavelengths simultaneously, and a large transflective touch screen display suitable for both indoor and outdoor operation. The M710 OTDR supports Real Time, Full-Auto, and Expert (manual) modes, precision event analysis, dual-wavelength testing, rich file naming, and an intuitive job set-up functionality. In addition to OTDR event analysis, pass/fail acceptance values, and marginal warning, specific values can be set to alert the test operator of failing or marginal events. Using one of the Least Squares Approximation (LSA) loss methods, events may be added or deleted manually. Thousands of OTDR and OPM test results can be stored internally or on the supplied USB drive, and are transferable via a USB cable or drive to a computer for viewing, printing and analyzing with supplied Windows® compatible software. Saved OPM loss values for a cable in one or two directions can be displayed in a table on the M700 for evaluation and comparison. 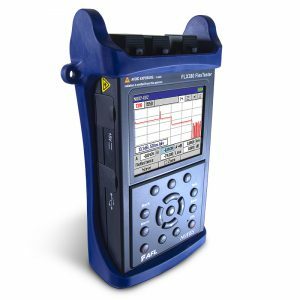 With short dead zones, a dynamic range of 44/42 dB, and greater than 8-hour battery life during continuous testing, the M710 is perfect for testing optical fibers in service provider metro areas.